Aulus Vitellius, born 12 AD, was a close friend of the imperial family ever since his youth. Caligula, Claudius and Nero all entrusted him with important offices. Early in 69 AD, he was proclaimed emperor by his legions in Germania and marched on Rome. After he defeated Otho at Betriacum, he was acknowledged by the Senate. Soon afterwards, the eastern general Vespasianus was proclaimed emperor by his troops and had Vitellius defeated by one of his sub-generals at Cremona in October 69 AD. He was killed in December while defending Rome against the attack of Vespasianus' army. His body was thrown into the Tiber and a damnatio memoriae was proclaimed. Spain (Tarraco? ): Gold, Silver and Asses, February (?) to July (?) 69 AD. Gaul (Lugdunum): Gold, Silver and Aes, January to February (?) 69 AD. 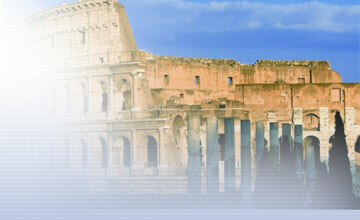 Rome: Gold, Silver and Aes, April to December 69 AD. 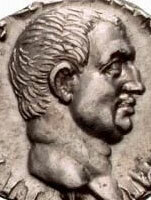 His portrait varies, but it usually is equally realistic as that of Galba and Otho; the Tarraco portrait being stylistically close to that of Galba. Vitellius mainly issued Denarii and Aurei since there were still many Nero and Galba AE coins in circulation. 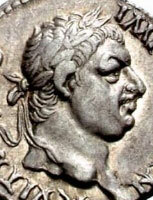 Despite his short reign Vitellius issued many different coin types, some propagandistic and new, others traditional. Quite a number of reverse types honour the loyalty of the army, for example the Denarius shown aside that praises the FIDES EXERCITVVM; the clasped hands symbolize the entity of the army and the emperor.